It should be borne in mind that a good workshop, and some sheet metal-working experience, would be of great help in the successful completion of this conversion. If you have any doubts about doing this yourself, a capable model engineer pal would be worth his weight in gold! 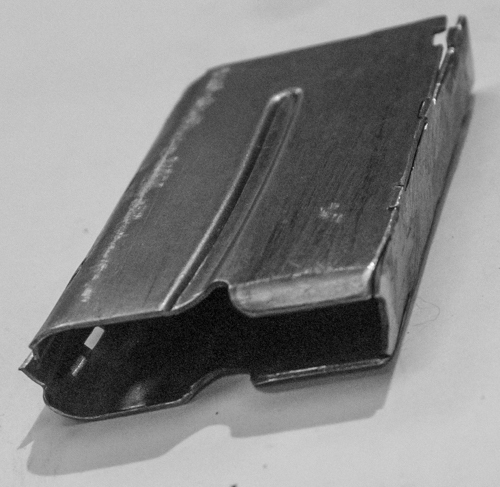 Quite obviously, a good toolmaker could happily manufacture a replacement magazine from scratch, but this option provides sensible half-way house to sourcing the appropriate materials in one place, and obviating the need for the fine work that would be required in shaping the magazine lips, sourcing a spring, and suchlike. 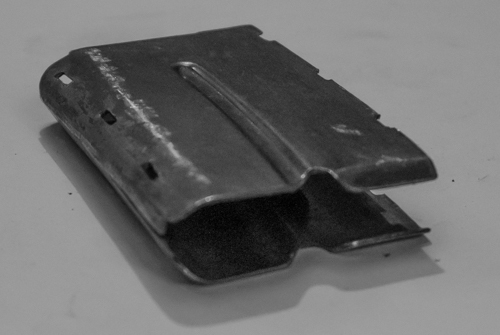 The only material required other than the donor magazine itself, is a flat strip of 18swg (0.048") mild steel sheet 1.375" long by 0.20" wide (before fettling). A table of dimensions is to be found at the bottom of the page. 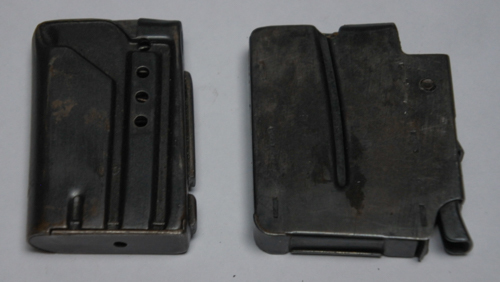 On the left in the next two images is the original magazine for the comparatively rare magazine-fed model of the War Office Miniature rifle. To the right of these images are views from above and below of the donor magazine for our replacement of a missing original. an example is considerably easier to come by than an original for the War Office rifle, which magazines are nowadays not unreasonably likened to "hens' teeth". An original magazine would nowadays be costly, even if one were to be found. The BSA Sportsman Five rifle is fairly common, and even a complete otherwise defunct rifle with magazine could be purchased for rather less than an original War Office rifle mag. the .22RF training rifle produced by the Birmingham Small Arms Co., for the Royal Air Force in the late 1940s. 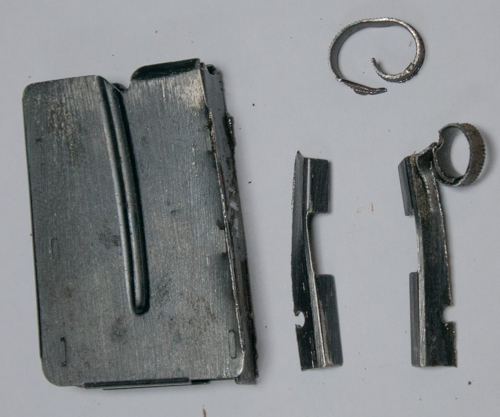 that was fabricated in a new platform rivetted high inside a standard Lee-Enfield .303"CF magazine shell. 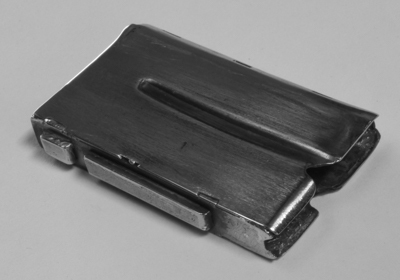 To achieve this, the release-lever, that previously permitted removal of the magazine from beneath the Sportsman rifle, was inverted in its compartment at the rear of the unit. 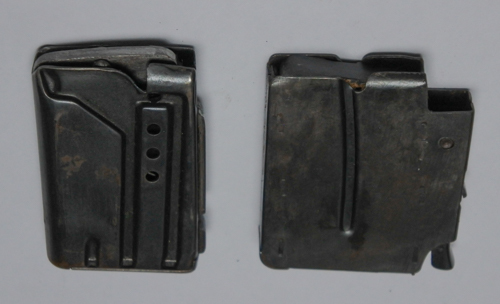 It could then be used to lock and release the magazine from above, within the Lee-Enfield full-size unit. 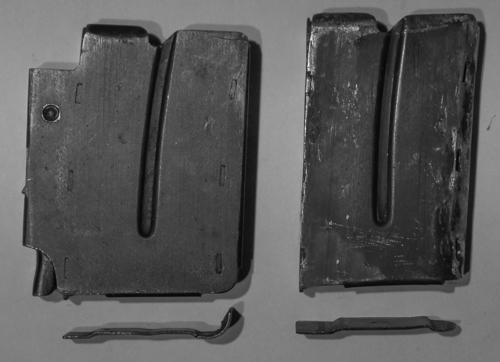 Below: the No.7 rifle magazine and .22RF insert, with the standard Sportsman Five magazine shown upper left for comparison. in our case, we used "nibblers" to limit distortion of the remaining side-plates, but a carefully wielded fine hacksaw would serve equally well. The result, and remnants, are shown below. The internal dividing spacer plate, locked in place with three lugs on each side (which engage in punched holes in the side-plates), will become the rear plate of the converted unit. There is another similar plate that spaces the front of the magazine. The front returns of the square-cornered side-plates must then be pressed, or carefully beaten, flat. A suitably radiussed mandrel is then used to form the quadrant curves, at the front of each plate (and handed), that will be brazed together to produce the rounded nose necessary for the conversion. The two halves are here rested together to check fit and the critical spacing between the sides. by filing until the meeting of the two halves affords the correct width at the front of the casing. It would be possible, before this, to fill in the three small slots each side that previously held the lugs of the removed forward dividing plate. and filling could cause unwanted distortion of the sheet and possibly anyway show in the final blacked finish. shortening to the correct length, and rounding the front to the shape of the magazine's new nose. It may be preferable to adjust the position of the ridges pressed into the base-plate; these ensure that it locks firmly in place under the pressure of the follower spring. front with the bottom of the lightly compressed spring being held down while doing so. 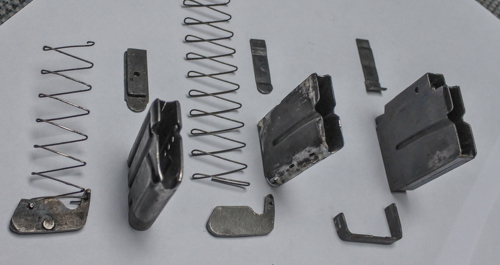 These images are all of early rough fitting, and there is much final finishing work needed before completion. It is sensible, at each stage of construction, to check the fit of the modified case in the magazine-well of your rifle. A good seating under the receiver sides, at the rear , and below the chamber, will ensure smooth feeding of the rounds. The black-cased cartridge is a specially produced Remington dummy for just such testing purposes. An idea can be gained of potential fit and appearance from above and below the rifle. The two-part spine, with the gap that forms the notch into which the sprung locking/release lever locates, has yet to be added to the rear of the casing. to fit smoothly inside the narrowing of the now round nose in the modified casing. 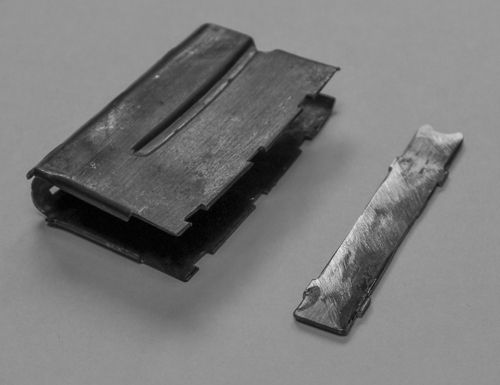 We also fabricated a follower to closely match the War Office original; the latter is shown left in the image below. 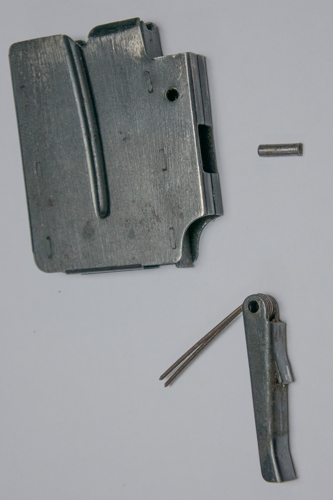 The replica follower's basic cut-out is shown centre; this was prior to drilling for, and fitment of, the three pins. 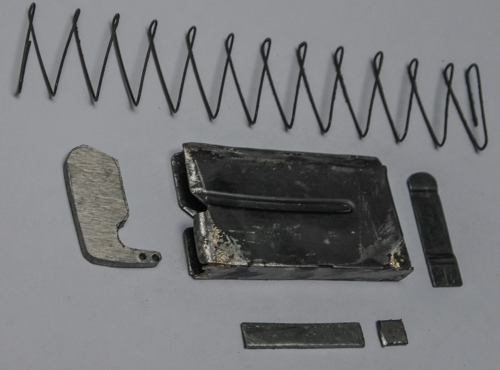 The part-prepared replacement items are also shown centre, and the standard Sportsman magazine, base and follower on the right. 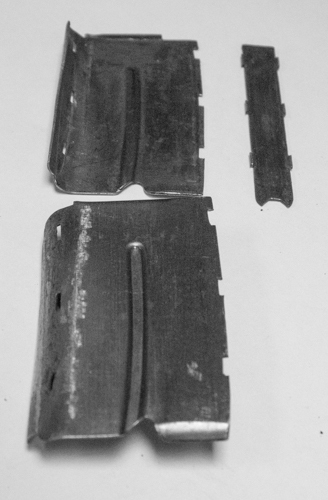 Below, the roughed-out conversion parts are shown in close-up. 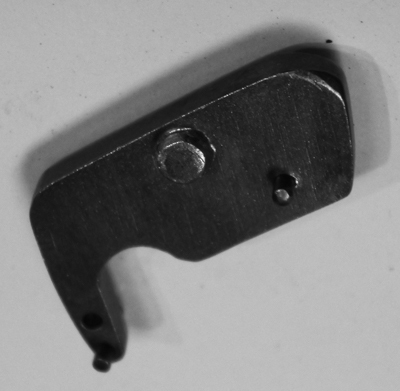 The end of the spring wire fits into the upper of the two small holes drilled in the tail of the follower. One of the two small-diameter guiding pins will be pressed into the lower hole. While a follower similar to the original will look far more in keeping, especially viewed from above the rifle's receiver, fitting such a replica is considerably more complicated than it may at first appear. The replica follower is shown below. 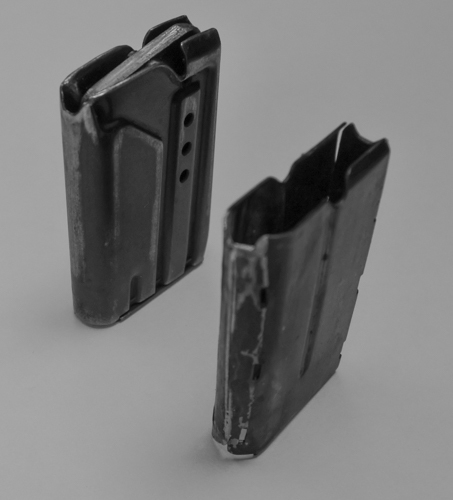 Provision has to be made to prevent the original style follower just being pushed straight out of the top of the magazine by the spring. 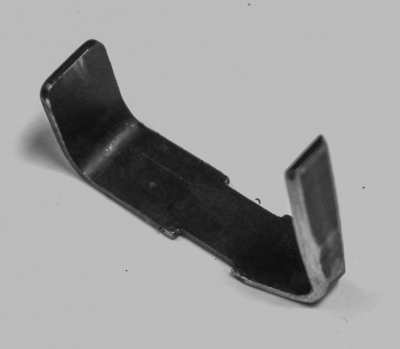 and the front pin is run forward and up, by the angled upper front depression of the pressing in the side-plate, to what is effectively a stop formed by its termination about a quarter-inch from the top of the casing near the magazine's round nose. but without interfering with the free vertical passage of rounds loaded above the follower. Such an arrangement needs to be planned and fixed inside each side-plate before they are brazed together. 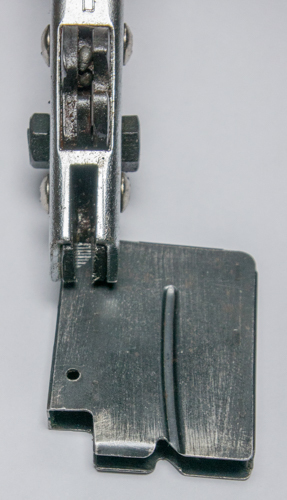 The larger, central pin through the follower runs against the central indent in the side of the War Office version, and also runs against the equivalent indent in the Sportsman conversion. If you are happy that you seek only a suitable magazine to render your rifle operational, then the complication just described would frankly be unnecessary. Below is a closer view of the conversion, with the two roughed-out spine/rib components now silver-soldered to the rear of the casing. 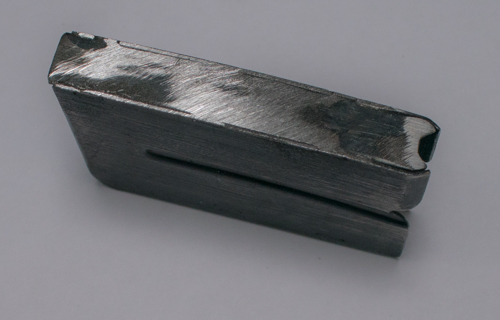 The gap between the longer, upper part of the spine, and the lower short section, forms the locking detent into which the rifle's magazine release lever locates. The shell, with these spine components added, is being fettled ready for finishing. The completed and refinished magazine lies between the donor Sportsman Five model and the War Office original. 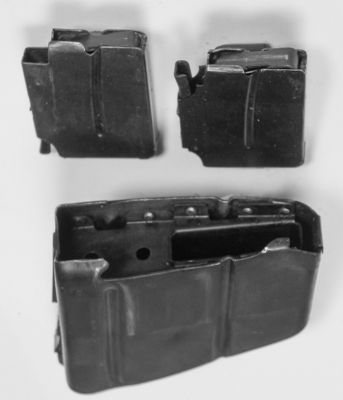 Here are two images, the left being of the near finished replica magazine base protruding beneath the rifle, and the right image showing an original magazine in place. ... and a view from above of the test round in the newly converted magazine. the possibility that a more accurate replica could be made by modifying a magazine from one of the 1903-1909 Savage semi-auto rifles; either the early model magazine or the1908 patent one. This subject has also been mentioned on the seperate page giving details of the origin of the War Office rifle's magazine, which lies with the Savage Arms Company' s design. 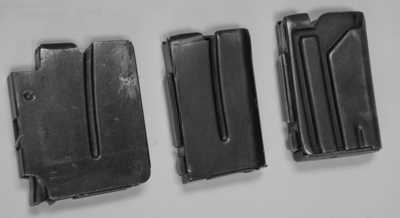 The Savage magazine is of virtually identical width, but is about "50 thou" ( 0.050") larger in the fore and aft dimension. 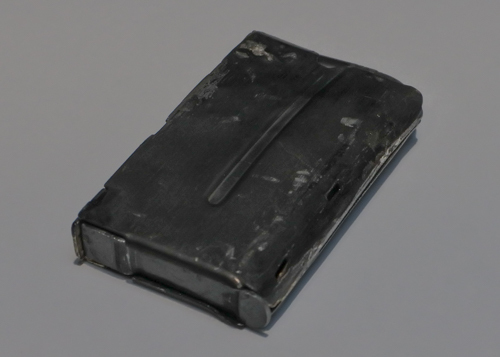 It would be perfectly possible to vertically slit the rounded nose of the magazine , remove some material from the new edges, and silver-solder or braze the edges back together to for a new, shorter nose. 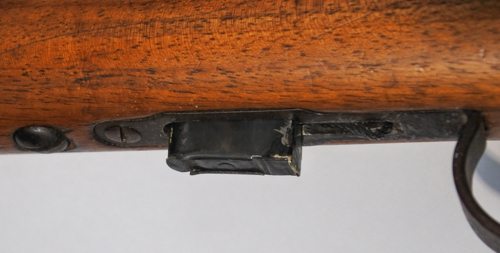 It may be possible to just file a new slot in the rear rib to engage the rifle's locking/release lever, but a more accurate replication would involve the removal of the magazine's pressed rear rib and replacement with a solid two piece one as on the original War Office version; this could be done exactly as described above for the conversion of the BSA Spotrsman-Five magazine. The "pro" of converting the Savage magazine would be near original appearance and the seven-round capacity, while the only "con" is the current value of the American product on the classic arms market; this could be anywhere between double and treble the cost of a BSA Sportsman-Five example, and is arguably more historically destructive. At the time of writing, Savage 1908 Patent magazines have been commanding well in excess of USD 100.00, when a complete rifle in well-used condition could be bought for USD250-350.